[Elco Jacobs] used to let his beer ferment in the kitchen, but when things got too hot over the summer, he had to suspend his ale making for a few months. Not wanting to have to put production on hiatus again, he modified an old refrigerator into an awesome fermentation unit he calls the UberFridge. 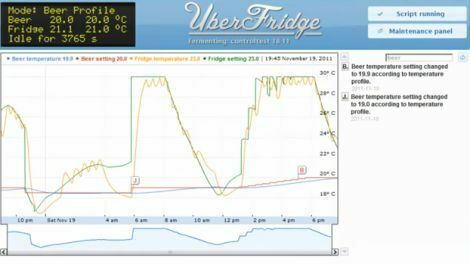 The refrigerator features two temperature sensors, one that sits in the fermenting beer, and one that measures the temperature of the fridge. This dual probe setup offers him the ability to closely monitor the fermentation process, which he does via a sharp-looking web interface. An Arduino serves as the PID controller, talking to a wireless router via a serial connection. The Arduino logs and relays data to the router where it can be viewed via a web browser. Not only can he keep tabs on what’s going on inside the fridge, he can reprogram the Arduino via the web interface as well. Keep reading to see [Elco] explain the ins and outs of his UberFridge – we’re pretty sure you’ll want to build your own after you do. Useful project, great write-up, minimal cost, energy efficient. I like that he uses the lamp to increase the temperature…. Ah! This detail really makes me like this build, and yes his project really does sell the hobby of beer brewing. Home Brewing is a lot of fun. If you are interested you should try it out. I currently have 2 batches in secondary waiting to be keged. So when is a Hackaday staffer going to start an in house brewery, and creating videos about their work? @ Colin. Fermenter? All dad had in the cellar/basement was a 35 G. crock with a bath towel over the top.